The Northern Highlands MPAA supports student activities in performing arts. Our donation helps enable students from Allendale, Ho-Ho-Kus, Saddle River, and Upper Saddle River to participate in choir, marching band, acapella, plays, and musicals. A necklace was donated to the NHHSA for their December 2nd Holiday Raffle and Luncheon. Our contribution will help benefit the students and programs of Northern Highlands Regional High School. This particular fundraisers makes it possible to run programs like the Ambassador/Freshman Boomerang project, Project Adventure Apparatus, and college admission events. 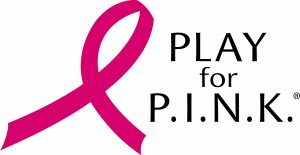 Play For P.I.N.K. is a grassroots organization dedicated to raising funds to fight breast cancer through sporting and lifestyle events. One hundred percent of the proceeds from fundraisers go directly to the Breast Cancer Research Foundation. Rotary club members believe in “service before self,” and participate in many activities, from planting trees and building housing for the poor, to digging clean water wells and delivering medication to the sick. On May 17, we donated a silent auction and raffle prize to the Allendale-Saddle River Rotary Foundation’s Annual Wine and Dinner Pairing event, which supports the Gift of Life program and the Bergen County Volunteer Medical Initiative. We sponsored Ethan Lewis, a high school student competing to raise money in honor of a local hero touched by blood cancer. Our donation goes toward advances in immunotherapy research. The Sunrise Association’s mission is to bring back the joy of childhood to children suffering from cancer through the creation of free day camps, in-hospital programs, and recreational activities. Our auction donation will go directly to making these dreams a reality for the many local children afflicted by cancer, as well as their siblings. The AIDS Walk New York walkathon fundraiser benefits Gay Men’s Health Crisis and over 50 other local AIDS service organization. This year’s event took place on May 21. We made a contribution on behalf of Lauri Murray to support the effort. Organizers estimate 20,000 people participated in this year’s walk. Temple Beth Sholom is a non-profit, egalitarian, conservative congregation in Park Ridge, NJ. They are dedicated to keeping a busy social calendar to bring together members of the Jewish faith. Their main fundraising event will take place on June 4. Silent auction bidders can enter to win a beautiful piece of jewelry from F. Silverman. If you are in need of a donation, do not hesitate to contact someone from F. Silverman. We’d love to hear more about your fundraising initiative.